Two years after the Arab defeat in the June War, Palestinian resistance organizations succeeded in taking over control of the PLO from within. Until then, the PLO had been an instrument in the hands of the Arab states. 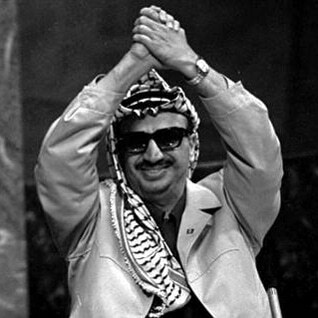 As leader of the largest organization (Fatah, nationalist), Yasser Arafat became the new chairman. Other groups belonging to the PLO were the Popular Front for the Liberation of Palestine (PFLP; Leftist), the Democratic Front for the Liberation of Palestine (DFLP; Leftist), the Popular Front for the Liberation of Palestine-General Command (PFLP-GC; Syrian aided nationalist movement) and al-Saiqa (founded by Syria). The Communist Party of Palestine, a close-knit organization, remained outside the PLO, as it was from day one (and in line with Moscow) an advocate of a two-state solution: a Palestinian state in Palestine alongside Israel. At the time, this viewpoint went against the PLO, which advocated the establishment of one secular state in the whole of Palestine, in which Jews, Muslims, and Christians would live side by side on the basis of equality and equal rights. This aim was to be realized through armed conflict. Although the leadership and most guerrillas were not accommodated in Palestine, Fatah, the PFLP and the DFLP each had grassroots support in Palestine. Upon taking the territory, Israel established a military government, headed by a military governor, who worked on the basis of military orders. These regulations were not restricted to ‘maintaining order’, but penetrated deeply into the lives of the Palestinians (issuing of permits, access to land, water management, and so forth). Between 1967 and 1994, about two thousand orders were issued. As was to be expected, the Palestinians did not submit to the occupation. An attempt to unleash a guerrilla war against the Israeli occupation force failed. Nevertheless, Israel did not manage to bring the Gaza Strip under control until the end of 1971. It did so by using large-scale violence causing many deaths. To control the area, whole streets were bulldozed, straight across the densely populated, compactly built refugee camps. Thousands of refugees were left homeless. Numerous family members of wanted persons were also imprisoned. Afterwards, resistance took on the form of strikes organized by shopkeepers, school pupils and lawyers, and appeals and petitions by notables and prominent political figures against the occupation. Israel, in turn, countered these challenges to its power by imposing curfews, arrests, large fines, and deportations (between 1967 and 1994, two thousand prominent politicians, businessmen, scientists and journalists were exiled to neighbouring countries). Israel used the Defence Emergency Regulations (established by the British in 1945) to justify these and other measures – such as blowing up the homes of guerrillas.